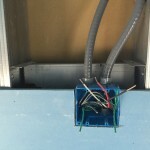 Since my last post, I built the interior walls, installed and wired the receptacle and switch boxes, wired them, and got it all inspected. 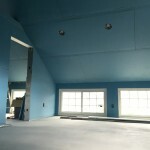 Hanging drywall on the ceiling and all the exterior walls before building the interior walls saves a lot of additional blocking, drywall cutting and time. I wish I had learned the trick earlier in my building career. 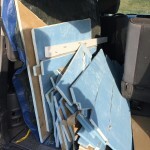 I’ve included a photo of the scrap drywall loaded in my car. 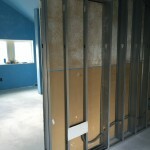 As you can see, of the 33 sheets of 4’x12″ drywall, there was very little scrap to take to the landfill. 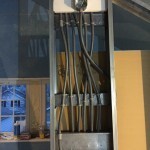 I used 6″ steel Studs to allow extra space to install the 6 circuits controlled by the switched at the top of the stairs and the pocket door that will lead from the main room into the bathroom. 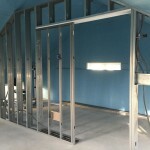 Once the wiring in the interior partitions was inspected, I went ahead and installed drywall on one side of the interior walls. 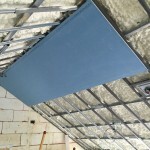 While I cut and fitted the drywall for the opposite sides of each wall, I held off installing them. 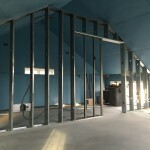 Steel studs are great to work with, but the walls have a tinny sound. 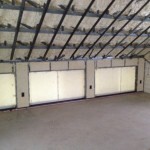 I have arranged for North Coast Insulators to spray foam the interior partition’s wall cavities to deaden the sound coming off the walls in the room. 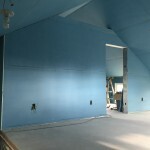 This is one of those cases where I would prefer not to spend the extra money, but I know in the long run I will regret not fixing the problem – and over the life of the room the extra cost will be minimal .